This is a genuine 40" x 60" U. Card stock ORIGINAL MOVIE POSTER issued by the studio when the film was released and meant for theatrical display. This poster is ROLLED, never folded. This is a very large poster! This poster has been RESTORED. It has been GEL SIZED. Gel sizing is a minimally invasive poster conservation method. When a poster has gone through the Gel Sizing process, it has been flattened, cleaned and de-acidified. The paper is impregnated with a purified form of sea gelatin which greatly strengthens the paper and physically eliminates creases and fold lines. It is NOT mounted to anything once completed, and the finished poster will remain dimensionally stable even after exposure to changes in atmospheric conditions. Comes with a Certificate of Authenticity from mpgrading. Although it now appears NEAR MINT, they have graded it 6.5 Fine. These can be very difficult to find in any condition! A long time can go by without one of these coming up for sale. You will have trouble finding a nicer one. EXTREMELY RARE COMPARED TO A ONE SHEET. Primarily offered for major motion pictures only, these were displayed both inside and outside of theaters. A 40x60 would cost the theater up to 20 times as much as a one sheet to rent. For most titles only a few hundred were usually printed, and it was only printed once. Unlike the one sheet which was printed in quantities of 10,000 and up. VERY difficult to find in Near Mint con dition because the card stock can crease easily. Please examine our extra large images very carefully! These detailed photos generally speak for themselves. We do not always list every little defect! We try and list any that we think are important or those that may not be readily visible. We realize that nobody likes surprises. For example, a C8-C9 poster will contain all the qualities/characteristics of a Near Mint C9 except for one or two very minor flaws that we believe prevent it from being a true C9. Sometimes it isn't possible to do this. Sometimes we can't roll a folded poster. Please note that if we hold your items for longer than 30 days they will NOT BE RETURNABLE. WE TAKE EXTRA SPECIAL CARE WHEN WE PACKAGE YOUR ITEMS. Folded posters are placed in a plastic bag or envelope and in between STRONG pieces of cardboard and taped together before being placed in the package. Rolled posters are put into a plastic sleeve and then placed in a HEAVY-DUTY TOUGH 3 or 4 diameter thick walled PVC tube. To protect ourselves, we insure expensive items for the FULL AMOUNT. These combined charges can add up to 25% or more to your final cost. For other European countries the charges will differ. Please check with your postal system on their procedure for packages from overseas so you are not unpleasantly surprised. You must notify us before sending it back. This is extremely rare, but it does occasionally happen. We know how to create a listing that will provide you with the highest dollar possible. We can yield for you MUCH MORE than you would get if you auctioned them yourself up to TEN TIMES or more! We will put in writing that we guarantee it to be an Original Movie Poster. 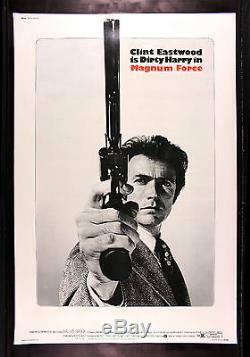 The item "MAGNUM FORCE CineMasterpieces HUGE 40X60 DIRTY HARRY ORIGINAL MOVIE POSTER" is in sale since Friday, May 31, 2013. This item is in the category "Entertainment Memorabilia\Movie Memorabilia\Posters\Originals-United States\1970-79". The seller is "cinemasterpieces" and is located in Scottsdale, Arizona.